If you want a new dish that screams fall, this was a pleasant surprise. I actually had this at a fine dining restaurant last year and have been trying to recreate it since, well this time I did it! If you like pumpkin, cinnamon and cream your in for a treat! 2 cups dry Pasta of choice cooked and drained to package directions, set aside tossed with 3 tablespoons olive oil and 2 tablespoons grated Romano cheese, keep warm. This makes two servings so double the recipe for more servings. 1/3 cup pumpkin puree canned or fresh click here for freshly made "how to"
In a large fry pan saute sausage in 2 tablespoon olive oil until the pink is all gone. Drain on paper towels, set aside. Add the garlic to the pan with whatever drippings are left. Saute one minute . Add wine, simmer around 4 minutes on high. Lower the heat to simmer, add the broth, pumpkin salt, pepper, nutmeg and cinnamon. Cook 1 minute. Add the sausage and cream. Toss this over the pasta generously adding grating cheese and either chopped basil. Garnish with grated fresh nutmeg or cinnamon. Hi, Claudia. While I miss blogging, I've been able to take off 25 lbs and get back to my "fighting weight" and I attribute a great deal of that to de-emphasizing cooking and eating. Sad, but true. That doesn't stop me from reading lots of great blogs, yours among them, and enjoying the occasional dalliance. Hope you like the rainbow cookies. They're a favorite of mine. I love all of the flavor combinations in this dish, especially the pumpkin. What an awesome idea for fall, Claudia! 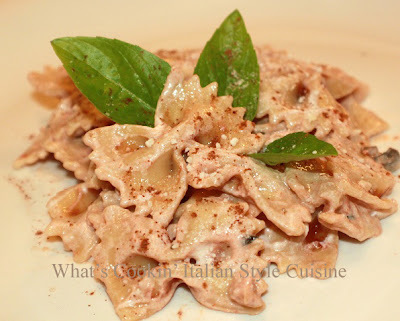 Claudia, another 'winner' pasta recipe from you!